Luton chief Nathan Jones wants his side to start turning their performances into wins starting at Peterborough this afternoon. The Hatters have been hugely impressive in all three of their matches this term, but only have one point to show for their efforts, while exiting the Carabao Cup as well. However, Jones believes it is only a matter of time before the displays his side are producing earn their rewards, as he said: “What we’ve got to do is start turning these performances into wins, because we went to Fratton Park and the Hawthorns now and have been very, very good, without picking up the right result. “Sometimes you’ll accept playing not as well and getting the three points, scoring early and having to defend it out, but we know that performances even out over the season. “So if we’re in good form and in a good place and so on, we’ll get the results we deserve. Hosts Peterborough are managed by the larger than life Steve Evans after he left Mansfield in March to take the hotseat. On locking horns with the ex-Leeds and Crawley chief on the touchlines, Jones continued: “When you come up against a Steve Evans side you know what you’re going to get. “You know the commitment levels he demands from his players, you know it’s going to be a tough game, and we’ll be ready for that. “Sometimes you want to match his enthusiasm and so on, but I don’t think that’s ever really been a problem for me, not at all. “Myself and Steve get on very well off the pitch, they’re fiercely contested games when we come up against each other, as he probably has those kind of rivalries with a lot of people. Evans has had to install something of a revolving door at the Abax Stadium over the summer, with a whole host of players going out a massive number coming in. Departing included former Hatters Jack Marriott and Ricky Miller, plus Jack Baldwin and Gwion Edwards, while on their way through the arrivals lounge were Stevenage forward Matty Godden, one-time Luton target Alex Woodyard and Aaron Chapman to name just three. It hasn’t affected them too much, with Posh winning two from two, including a 4-1 success at Rochdale, to sit third in the table. On their opponents, Jones added: “They have a strength in depth that you need at this level, so they’ll be a real test and we know that. “It’s a difficult game when you go to Peterborough, kind of local, because it’s not an overnight stay, but we’ll be ready, we’ve got our own threats as well, which I’m sure they’ll be aware of. 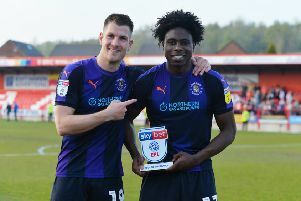 “They have and they’ve had a big turnover in terms of players, player they’ve lost are real quality, our own Jack Marriott, Gwion Edwards, the boy Andrew Hughes the left back, a lot of good players. “They’ve replaced them with good players, but that’s what happens.they’re a club that develops players in certain ways and moves players on, and they function that way. “Barry (Fry) and the chairman (Darragh McAnthony) they do a good job of sustaining a club and trying to move it forward. “They’ve gone with Steve who has a record of turning players over, I mean that in the best sense of the word, not a derogatory way, in terms of he knows what he wants, moves quickly on players, players move on for money as well. “So he does a good job in that way and they’re a good club.